With these invented Watering Globes, you don't need to worry about leaving your plants unattended! Great for houseplants, hanging plants, and patio plants. Plant automatic watering bulb ball,never worry about leaving plants unattended.Slowly lets water out into planter over the course of 3-4 days,great for mini houseplants, hanging plants, and patio plants. Made of PVC material, non-friable, good permeability, durable and convenient. Large size: 10x3.12inch, Mini size: 5.1x2inch. Design:Transparent plastic body,convenient for you to observe water consumption of plants,and adjust the water volume in globe according to it.You can also filled it with nutrient solution or insect repellant,perfect for looking after your plants. 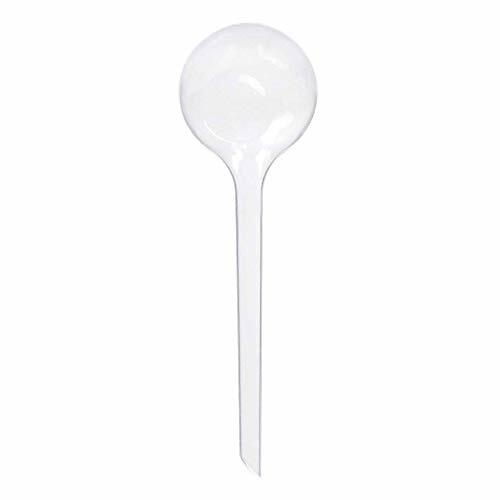 Easy to use:Just pinch the globe,filled with water and inserted into the soil.Plastic body is more easier to draw liquid. Note:This is plastic product,do NOT filled it with corrosive liquid. And they are not completely transparent!